As well as tasting great, goose fat is also good for you in comparison to other animal fats. It is high in 'heart healthy' mono-unsaturated fats which can help lower blood cholesterol level. Today's goose has a lower fat content than lamb and beef - and the fat contains a relatively low proportion of undesirable saturated fats and a higher proportion of the more desirable mono-unsaturated and essential fatty acids and contains only a trace element of cholesterol. The biggest selling point however is the unsurpassed taste of foods cooked using goose fat and traditionally has been prized in Europe for frying and roasting vegetables. It has rightly become famous for making the ultimate roast potatoes, but the unique fat can be used to make so many more delicious dishes. Goose fat is incredibly versatile because it has a high burning (or smoke) point which means foods can be cooked at a high temperature without the fat burning or breaking down. 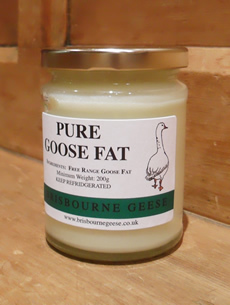 Jars of goose fat are now available from Brisbourne Geese. 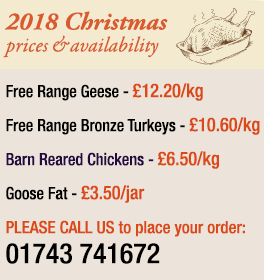 Each jar contains a minimum of 200g pure free range goose fat and is available from our shop when collecting your goose, bronze turkey or chicken.